I could just eat him up he's so sweet! He loves our bed......and we don't mind sharing it! I was actually out in the yard from 3:30-5 am playing with him, trying to tire him out. In the middle of the night we want him to look like this. But that's ok, I love him anyway! Here's wishing you a restful sort of day! Oh goodnessssss! That baby is so sweet. We have two labs and he reminds me so much of the days when I was drowned in puppy breath the second I got home each night. He is giving me puppy cravings! soooo adorable! What a sweetie!! 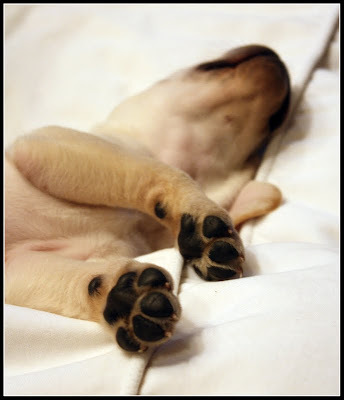 I love when they sleep like that...you can forgive them all the sleep you lose! How freaking cute is he! I love the puppy stage!Enjoy your new bundle!!! Soooooo precious!! Love it when they roll over to show their belly. Enjoy this sweet time. They grow up so fast. I love him! ;) He is soo cute! He is ADORABLE!!! Love those big paws and that sweet face! So precious. Fair warning though...I have a lab as well, a full grown one isn't nearly as easy to work around on the bed! 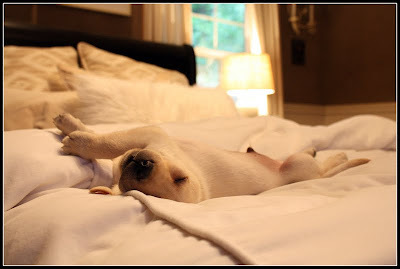 We spend many nights in an "H" formation, clinging to the edges of the bed while the dog stretches out in the middle. I just love puppy belly. Watch out, though. Adult dogs will get your bedding oily from their fur...and it doesn't wash out. Enjoy his puppy-ness because soon he will be a big boy! You made an excellent choice of dog for your kids! Soooo cute!! Puppies are the best! They are the cutest puppies and the best dogs ever. We have two labs (chocolate ones) and they are wonderful. It gets a little crowded when they want to sleep with you and they are 70 pounds or so. I wanted another puppy so we also have a tiny Morkie (maltese/yorkie) who weighs 3.5 pounds and holds her own around the labs. Good luck on your sleep! TOO CUTE!!!!!! Enjoy him, he is just precious! Adorable!!! we have a lab too, he's 8 now and still a puppy, great shape. Warning: they love food and they get much bigger - do you have a King size? *** What a PRECIOUS ONE!!! And hat a CHUCKLE!!!!! We too, are going thru the SAME THING, with an eight year old "sister" to the new pup to boot, and who "accepts" her of course, but who oviously thinks the "wee one" is a PIA sometimes, with all the ENERGY that pup has to spare!!! ya just CAN'T get angry, even when they're "bad", cuz they're soooooo darling and besides, they're just BABIES!!! Best of luck... keep the Aspirin handy... we are (but I wouldn't have it any other way, cuz thhis SWEETIE is a BIG, PRECIOUS DOLL-BABY!!! Smiles!!!). We just brought home a new puppy a few days ago so I completely understand! Your new puppy is so cute and adorable. AAAAAWWWWwwwwww! And puppies smell so good too...what cuteness! wünsch dir viel freude mit hundli. Harley is so cute. Must tell this quick story about our granddaughter (5). She was laying in bed the other morning trying to wake up and their Dixie BeLL (black lab puppy 7 months old) jumps on the bed and is licking her in the face. dixie Bell turns around and her tail is just a going. karlie Anne grabbed DB by the tail and said, "no Dixie, no happy tail!" I can't quit laughing thinking about it! Karlie Anne is not a morning person. Harley??? or MARLEY??? Hope he's not like the one in the book. That baby is so sweet. soooo adorable! The bed thing is a slippery slope though! We had a sweet puppy in our bed too - now we have a 90 lb lab who likes to spoon! His nickname is "closer" because no matter how close he is - he wants to be closer.